Kyle T. Winslow joins McAllister & Quinn as a Managing Director with nearly a decade of experience in federal research and development programs and public policy, focusing in particular on energy issues. 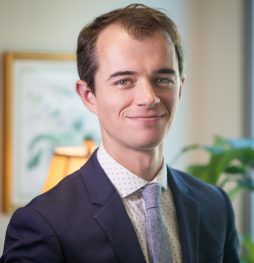 Prior to rejoining McAllister & Quinn, Kyle was appointed by DC Mayor Muriel Bowser to serve in the Mayor’s Office of Policy and Legislative Affairs as the lead for legislative and regulatory issues under the jurisdiction of the Council of the District of Columbia’s Committee on Transportation and the Environment and Committee on Health. Previously, Kyle served under the Obama administration as Legislative Director at the US Department of Energy’s (DOE) Office of Energy Efficiency and Renewable Energy. In that role, Kyle led the close communication between DOE’s renewable energy, energy efficiency, and sustainable transportation programs and Congress; facilitated the effective rollout of the President’s Budget Request with Congressional committees of jurisdiction; and helped to advance the administration’s various policy objectives—including, for example, securing robust research and development investment in wind energy, forming new manufacturing public-private partnerships between government and industry, and fighting for strong appliance energy efficiency standards under the Climate Action Plan. Before joining the Obama administration, Kyle worked at McAllister & Quinn with stakeholders from industry and research universities to identify federal opportunities in science and technology research, and to influence public policy on related issues on the Hill. Kyle earned his M.P.P. from the George Washington University, and earned his B.A. in English from Bucknell University.